Take your first step into an exciting world of fantasy adventure with the Pathfinder Roleplaying Game Beginner Box! Within you’ll find simple rules to create and customize your own hero, as well as a robust system to run your character through challenging adventures and deadly battles against villainous monsters like goblins and dragons! Will you be a courageous fighter who masters weapons and armor to cut a trail of destruction through your enemies? A wise cleric who calls upon the power of the gods to heal your allies and burn enemies with sacred fire? A witty rogue able to disarm traps and strike with deadly accuracy? A brilliant wizard whose magical powers bring foes to their knees? All the details of your character are yours to control. The only limit is your imagination! The Pathfinder Roleplaying Game Beginner Box is packed with everything you need to get started with the Pathfinder Roleplaying Game, an imaginative tabletop fantasy adventure game for 2–5 players. Scores of monsters, challenges, and advice give gamers the tools to create their own worlds and adventure, providing countless hours of gaming excitement. With streamlined rules and a focus on action-packed heroic adventure, this deluxe boxed set is the ideal introduction to the world of the Pathfinder Roleplaying Game, and the best starting point for a lifetime of pulse-pounding adventure! This exciting boxed set contains everything a new gamer needs to get started with the Pathfinder Roleplaying Game, the smash hit RPG system that has taken tabletop gaming by storm. From dice to game pawns to simply stated rules, this box is the ideal entry point to the world of Pathfinder. Unboxing a copy of the Beginner Box to show off its shiny new contents! What the heck is an RPG? When someone says “role playing game” often people either think of people dressed up like elves or other mythical characters beating each other with foam swords. That is most likely what is called a live action role playing (or LARP for short). Pathfinder is what is termed a paper RPG, meaning it uses pieces and a game board and is designed to play on a table (think Dungeons and Dragons). There are more rules than a boardgame but less restriction and more room for creativity. RPGers are usually loyal to one or two systems and often play them exclusively for years (not in one sitting). Consequently the financial investment by these players in a particular system can be great, as more and more characters, miniatures, scenarios and rulebook revisions come to market. With RPG’s (especially Pathfinder)it is as much about the journey (the story created) as it is about the destination (winning). What is great about the Pathfinder: Beginner Box? 1)	It has everything you need to get started. The Beginner Box is a complete RPG introduction kit designed to welcome players new to paper RPGs and the Pathfinder system. It includes everything you need to run a full campaign in one box such as counters, dice, maps, character sheets, rules for players and GM. Also included are cardboard stand-up pawns of heroes and monsters which allow you to play the game without buying expensive miniatures. Miniatures are available to make the game better, yet painting, collecting, and storing minis is expensive and time consuming. The most important components are the two rulebooks: The Hero’s Handbook (64 pages) and the Game Master Guide (95 pages). The Hero’s Handbook has rules for the four classes: cleric, fighter, rogue, and wizard. The majority of the The Hero’s Handbook is dedicated to character creation, while a third of the pages present illustrated and detailed equipment lists and combat rules. Half of the Game Master Guide consists of monsters and their magical loot, while the other half is spent on a full intro adventure and tips for leading game sessions. It has ideas on creating a story, how to draw dungeons, level design tips like avoiding symmetry, mixing up the encounter with puzzles, roleplaying opportunities, and other useful tips. 2)	You will have people to play with. At GenCon 2012, the line at the Pathfinder booth was one of the longest. There were lots of people standing there with Pathfinder items in there hand ready to checkout. I have heard that it is currently outselling Dungeons and Dragons. Because there is an investment of time in any RPG, you will want to make sure that you are investing in something that you will actually get to use. 3)	It is new. This may sound like a bad reason at first but it isn’t. Many RGP systems often have life cycles. You do not want to start in one that is in its last years, where players are leaving for other, newer systems. You get to get in on the “ground floor” as Pathfinder has only been in existence for about 3 years (D&D 3.5 has been around longer though). You won’t be playing players with 10+ years’ experience in Pathfinder but players close to same starting point as you. 4)	A solid publisher. A good publisher means the world to a RPG and Paizo Publishing definitely fits the bill. Solid design, great art and the assurance that they will still be in a couple of years. They have experience in the RPG (with D&D 3.5 – which can be compatible with Pathfinder) and boardgames (with games like Kill Dr. Lucky and Falling). 5)	Solid gameplay. I am not an experienced RPG player but those I have talked to say Pathfinder is a very good system. The introductory adventure they give is simple but effective and is extended online by a continuation adventure. The game can be played solo to help learn the materials. There is also a wealth of D&D 3.5 materials by Paizo to expand your game immediately. For a more in-depth gameplay explanation see pookie’s review and the official rule book link. So if you are interested in dipping your toe in the water of RPG’s this is the way to go. And feel free to dress up like an elf and beat someone with a foam sword anyway. Having the game in front of me but no one to play it meant doing some extra research especially during a month where this was an explorable game in need of more reviews. Instead, here’s a summary of the 27 current reviews on Amazon.com. First, it got excellent reviews! 4.8 out of 5 stars. The worst review was 3 and S. Nelson’s main beef is that he wanted something more like the older D&D basic/expert where you could go well past experience level 5, which is the maximum for this game. Honestly, if I didn’t have 100+ great board games to play with people whose company I enjoy, I’d be willing to play this in a heartbeat! In the meantime, thanks for reading and I hope this unusual review was beneficial. In 2010, I wrote the White Box Fever series of reviews that in turned looked at the then available titles that would serve as an introductions to our hobby and to fantasy roleplaying. In turn, I reviewed Wizards of the Coast’s 2008 Dungeons & Dragons Roleplaying Game Starter Set for Dungeons & Dragons Fourth Edition, Fiery Dragon’s Tunnels & Trolls v7.5, Swords & Wizardry: White Box Edition from Brave Half Publishing, Wizards of the Coast’s Castle Ravenloft Board Game, James Raggi IV’s Lamentations of the Flame Princess Weird Fantasy Roleplaying, and Ancient Odysseys: Treasure Awaits! An Introductory Roleplaying Game from Precis Intermedia. The purpose of this? All as a lead in to a review of the Dungeons & Dragons Fantasy Roleplaying Game Starter Set, the very first release in Dungeons & Dragons Essentials line that was Wizards of the Coast’s re-launch of Dungeons & Dragons Fourth Edition. Yet when it came to fantasy roleplaying, there was one title missing from this series – the Pathfinder Roleplaying Game. The reason for that is simple. At the time of the launch of the “Red Box” styled Dungeons & Dragons Fantasy Roleplaying Game Starter Set, there was no introductory set for the Pathfinder Roleplaying Game. Now there is, and of all of the available introductory sets for fantasy roleplaying game, the Pathfinder Roleplaying Game Beginner Box is the heaviest, the most attractive, the most well put together, and the most expensive of them all. This set is designed for use by between two and five players aged thirteen and up, and take their adventurers from fist to fifth levels. Opening up the box reveals two sealed packets, the first containing a set of polyhedral dice, the second a set of twenty stands for use with the eighty counters included further into the box. Below this sits the “Welcome to a World of Adventure” sheet that guides the player through the rest of the Pathfinder Roleplaying Game Beginner Box. This sheet asks what role the reader wants to take – solo player, playing as part of a group, or Game Master and then directs them to the appropriate starting point. For example, if the reader wants to get started without the need to read the rules, then he is directed to the “HERO’S HANDBOOK” and play through the adventure that teaches him the game. Underneath is there are four expanded and pre-generated character sheets, one for each of the Classes given in the Pathfinder Roleplaying Game Beginner Box. Each sheet explains what the Class is good at, describes each of the elements on the sheet and how they work in the rules, and gives some background on the pre-generated character. The four include a Human Fighter, an Elf Rogue, a Human Wizard, and a Human Cleric. The four are reasonable creations, although it is a pity that no Dwarf character is included in the four. The game is explained in two rule books. The first of these is the sixty-four page Hero’s Handbook, the second the ninety-six page Game Master’s Guide. Both of these slim volumes are cleanly laid out and very nicely illustrated. They are also easy to use, each including not just an index, but also several pages of references at the rear of the book. Rounding out the contents of the Pathfinder Roleplaying Game Beginner Box are a double-sided Flip-Mat and a set of counters each of which can slot into the plastic stands provided. One side of the Flip-Mat displays a map of “Black Fang’s Dungeon,” the adventure described in the Game Master’s Guide, whilst the other side simply contains a plain grid pattern. Both dry-erase and wet-erase write pens can be used with the Flip-Mat. Lastly, the eighty full colour card counters are easy to punch and depict both the characters that the players can make using the rules in the Hero’s Handbook and the monsters in the Game Master’s Guide. A nice touch is that every combination of Class and Race possible using the rules in the Hero’s Handbook is covered in the counter mix. So, for the Cleric, there is a Human Cleric, an Elf Cleric, and a Dwarf Cleric, one male and one female for each Race. The last item in the box is a flyer for the next step to take once the GM and players want to go beyond the contents of the Pathfinder Roleplaying Game Beginner Box. Open up the Hero’s Handbook and the reader is quickly thrown into “Skeleton King’s Crypt,” a short twenty-three entry solo adventure that guides a character into a small underground complex that is thought to be one of the many sources of monsters that threaten the town of Sandpoint. It is a simple affair that easily demonstrates how the rules work. What it is not is a demonstration of how the different characters, or rather how the different Classes work, something that Wizards of the Coast’s Dungeons & Dragons Fantasy Roleplaying Game Starter Set demonstrated very effectively, though it should be pointed out the Pathfinder Roleplaying Game Beginner Box does a better job of creating character generation than Wizards of the Coast’s Dungeons & Dragons Fantasy Roleplaying Game Starter Set did. After an all too short explanation of what a Roleplaying Game is followed by a similarly short example of play, the Hero’s Handbook gets down to the basics of how the game is played (mechanically, this would be roll a twenty-sided die, add any bonuses from the attributes, skills, or saving throws that apply and get as high a result as possible) and then onto character generation. Here is where the design of the Pathfinder Roleplaying Game Beginner Box really begins to shine – and all it takes is cross-referencing. For example, letters corresponding to the sections and their explanations on the four expanded pre-generated character sheets as well as on the sections on the standard character sheets correspond to the relevant sections throughout the character creation process in the Hero’s Handbook. By working through the corresponding sections, a player can quickly create a character. Each section gives aspects that a player needs to note down on the character sheet, most of them mandatory, some of them giving the player several options to choose from. For example, a Wizard must choose his Arcane School. If he chooses the Evocation School learns attack rather than defence or trickery spells and can cast the spell Burning Hands one per day and Force Missile several times a day. The Hero’s Handbook gives just the Universalist and the Illusion Schools in addition to the Evocation School. In comparison to earlier versions of Dungeons & Dragons, one pleasing aspect of the spellcasting Classes in Pathfinder Roleplaying Game is that they get features that they can do all of the time. For example, the Wizard can freely cast the Cantrips Detect Magic, Mage Hand, Ray of Frost, and Read Magic without using up a spell as he would in other RPGs that feature Vancian magic. The Cleric has similar features, but they are called Orisons rather than Cantrips. All four of the Classes provide everything that a player needs to know make his character second, third, fourth, and fifth level. Again these guidelines are easy to work through and apply to a character sheet. Equally, the guidelines to completing a character are easy to work through, being organised by Class and giving several suggestions as to what a player should select from the following lists of Skills, Feats, and Equipment. One issue is that the number of Feats is limited, especially if the character is a spellcaster. A nice touch is that every single piece of equipment is accompanied by an illustration. The Hero’s Handbook is rounded out with an explanation of how the game is played. The rules cover everything that a player needs to know in terms of exploration and combat. In keeping with the rest of the volume they are an easy read, and the rules are themselves supported with a glossary of terms and a Combat Reference Guide, the latter on the back cover of the Hero’s Handbook. Just like the Hero’s Handbook, the Game Master’s Guide gets down to the play of the game straight away. “Black Fang’s Dungeon” is just ten entries long, and although only a basic scenario, it presents a good mix of encounters. Not just combat, but also traps and puzzles as well as a little roleplaying. As written, the GM could begin running this with fifteen or so minutes’ worth of preparation – the same time that the players would need to devote to reading and understanding their character sheets. For anyone new to roleplaying, there is probably a good session or two’s worth of play in the scenario. If the GM has more time, then the following section on Gamemastering is worth reading as preparation for running the scenario. The remainder of the Game Master’s Guide is devoted to “Building an Adventure.” The advice is good, explaining how the GM should start with the story and build up from there. Some of it is geared towards the GM creating the “Ruins of Raven’s Watch,” the first dungeon of own design, for which a map and some background is provided. To support the advice, the Game Master’s Guide explores how different environments, from the dungeon and the forest to the desert and the city, can be used to enhance a game, coupling each different environment with a lengthy list of monsters that could be encountered within each setting. In terms of rewards, hundreds of magical items are not only described, but also illustrated, these ranging from simple scrolls and potions to wondrous items like Bandages of Rapid Recovery and Slippers of Spider Climbing. Some forty monsters and enemies are described in the Game Master’s Guide. 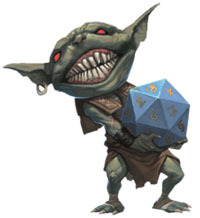 They range from the lowly Dire Rats, Goblins, Orcs, and Skeletons, each with a Challenge Rating of 1/3, up to creatures with a Challenge Rating of 7, such as the Ghost and the Medusa. Top of the heap though, at least in the Pathfinder Roleplaying Game Beginner Box, is the fiercesome Black Dragon, with its Challenge Rating of 8. All of these are represented by the counters also found in the box. Rounding out the Game Master’s Guide is a description of Sandpoint, the coastal town introduced in Pathfinder #1—Rise of the Runelords Chapter 1: “Burnt Offerings”, the inaugural entry in Paizo Publishing’s Adventure Path series, which the player characters can use as their base of operations. It should be made clear that the Pathfinder Roleplaying Game Beginner Box does not present a full version of the Pathfinder Roleplaying Game. It is a streamlined version of the game, which shows in the limited choice of character Classes, Races, Skills, Options, Feats, and spells, as well as simplified combat rules – no rules for “Attacks of Opportunity” or the capacity for characters to “Take 10” or “Take 20” for example. 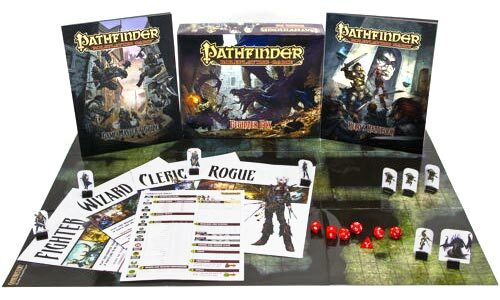 None of these omissions should be counted against the Pathfinder Roleplaying Game Beginner Box as it is designed to introduce new players without burdening them with the complexity to be found in the Pathfinder Roleplaying Game or facing the daunting prospect of opening up what is a weighty tome. There are only just a few issues with the Pathfinder Roleplaying Game Beginner Box. Ideally, the dice should not have been one colour, but each in the set a different colour to help easy identification and use during the game. The given example of play included in the Hero’s Handbook could have been longer and thus done a done a better job of showing how the game is played. The box could also have done with another scenario. The one in the Game Master’s Guide does a good job of presenting an introductory adventure, but it lacks the sophistication to be found in the scenarios available from Paizo Publishing for the Pathfinder Roleplaying Game. A more sophisticated adventure would also have presented the GM with an example when it comes to writing his own in addition to giving more of a challenge to the players. As much as the red box styling and the Larry Elmore artwork of Wizards of the Coast’s Dungeons & Dragons Fantasy Roleplaying Game Starter Set delivers a one-two punch to the nostalgia nerve point, the Pathfinder Roleplaying Game Beginner Box honestly delivers so much more. And, not just because it allows characters to go from first to fifth level. It provides more options, more ideas, and more for both the GM and the players to play and work with. You simply get more for your money! The other thing that the Pathfinder Roleplaying Game Beginner Box has over the Dungeons & Dragons Fantasy Roleplaying Game Starter Set is that despite the name change, it will still be familiar to anyone returning to the fantasy roleplaying fold after being away for a while. After all, the Pathfinder Roleplaying Game is a direct descendant of Dungeons & Dragons, and even if this Beginner Box is essentially the “Basic” Pathfinder Roleplaying Game, it still makes it very easy for anyone familiar with Dungeons & Dragons to pick this up and start playing. Of course, the Pathfinder Roleplaying Game Beginner Box is really aimed at the new player. Any new player who opens this box will find an attractive set of contents that present the game’s rules in an easy to read and learn fashion, all accompanied by artwork that exemplifies the feel and action that those rules want to impart. The truth is, out of all of the introductory fantasy roleplaying games currently available, the Pathfinder Roleplaying Game Beginner Box is the most comprehensive, the most accessible, and the most enjoyable. And an excellent introduction to Pathfinder Roleplaying Game to boot. Great introduction to the iconics and Sandpoint. If you are going to be showing lots of people how to play the game (and let’s face it, you’ll probably want to), then you should buy the package of Iconics Miniatures so you can have the complete package. Much better than the cards, though if you have some Pawns (see other packages), you can use these for consistency. I just find the minis actually add to the enjoyment of the players and most have really liked them. Good detail on the sheets and make it really fun to jump into the story. Great job there Paizo! Thus my overall score of 3/5. If you teach people to play games though, this is the best of the best and is excellent in helping them to want to roll up their own characters for the full Pathfinder RPG. This system has everything in my opinion and this set has every one needs to get started. This and a little imagination are all two people to have the best of times. Take a chance and try RPGs and when you do – try this set! the box is a great place to start pathfinder. they give you the very basic, so you are not over whelmed. Add a Review for "Pathfinder: Beginner Box"